#hashtagged is a chilling new science fiction novel about a daughter's journey through her father's past and into a frightening future. This future is something that Oliver Smith has seen first hand and for which he has been preparing his daughter, Madeline. After Ollie's death, Maddy must follow a trail of secrets that leads her into the arms of her first love, Jagger, the only person that can truly help her fight against a future world governed by artificial intelligence. #hashtagged shows us in terrifying detail the dystopian world we create through every #hashtag, Twitter, and Facebook update. Since the birth of the internet, data has been collected, categorized, analyzed. This data forms a picture. A picture that defines humanity. Through this extensive and carefully labeled definition, artificial intelligence has been taking notes. #hashtagged by Kimberly Hix Trant jumps into the future where the collection of data has been completed and the application of data is current. Just one problem, the application has pushed the human race into a dystopian world where machines rule. Enter Maddy Smith, thirty years earlier. She's been preparing for this her whole life. Maddy is an intelligent main character who opens up more and more to the reader as the story progresses. Without her knowledge, Maddy has been trained for the day the world would need her to intervene. Ollie, her father, was a computer genius who kept secrets. Lots and lots of secrets. Readers will thoroughly enjoy traveling across the United States (and time) to help Maddy change the outcome of the human race. Though Maddy works more as the eyes and ears of the reader than a down to earth character. The future is the focus of the novel while Maddy is the chance to rewrite it. A simple connection will be made between Maddy and readers, but the story line will keep the pages turning. The plot begins with the introduction of Maddy and her unusual training. And then a game begins with the death of her father. A game that turns out to be more serious than life and death. Ollie left a clue for Maddy: a key to an old chest of drawers. In that chest of drawers is a box that Maddy cannot open. And thus, the journey to change the fate of the human race begins. 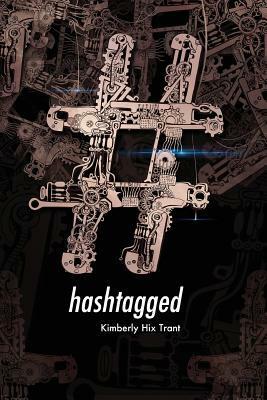 #hashtagged is a unique futuristic novel that is both intriguing and horrifying to readers as we currently walk the path Trant marks as dangerous.